Medical technology has been improving at an incredible rate from the past decade, leading to leaps and bounds in the quality of care for people around the world. 3D dental imaging allows dentists to see your mouth that was not previously possible with X-ray or medical CT scan technology. 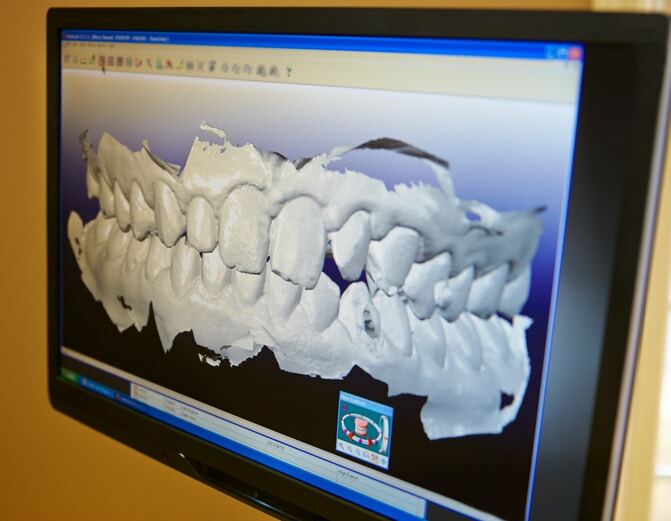 3D dental imaging allows dentists to view your teeth and skull, so they can diagnose any dental issues you are experiencing so they can provide the correct treatment for you. Traditional X-rays can only develop a 2D picture of your mouth, while other methods took a longer period of time, along with radiation exposure, to create a detailed picture. They were more unpleasant and intrusive to the patient. 3D dental images are most often used for diagnosis and treatment planning. Being able to see the mouth in three dimensions allows the dentist to better and more effectively formulate an approach to treat different dental conditions. It enables the dentist to effectively plan complex cases. Plan a customisable smile designing. Treatments from root canals, implants, bone grafts, inlay, onlay, crowns, and much more. Since you get a complete view of the tooth, its roots, and the bone surrounding the tooth structure around the tooth, which is never possible with traditional technologies. Whether you are planning for braces, night guard, retainers, or minute corrections in the bite, it will help if you create a 3D image of diagnostic orthodontic concerns and treatment planning. The size of the primary X-ray beam in 3D CBCT scanners limits the radiation to only the area of interest, reducing the patient’s exposure to radiation as much as possible. CBCT technology is designed to create a complete digital model at the end of the process. The software also provides your dentist with a relatively large choice of display formats, allowing for 2D, 3D, and panoramic views of the mouth and head, along with other viewing options, to help focus in on areas of interest. It allows your dentist to plan a future outcome of the line of treatment planned. No need to bite down on a paste, mould, or piece of plastic. The CBCT can scan your entire head without you needing to do anything. This is especially helpful for patients with particularly sensitive gums or teeth or patients with gag reflex, as well as paediatric patients. So, the chances are high that next time you go to the dentist in need of a night guard, a crown, or to an orthodontist for braces, chances are increasingly good that you won’t have to get a gooey rubbery alginate impression in your mouth and wait a few weeks for your appliance or restoration. 3D printers have taken their place in the field of dentistry with some with workflow in dental labs which is, with seemingly constant evolution. Do you want to a check up from your dentist? Contact Dentist Collingwood today to book an appointment.